“Antoine-Louis Barye lived his entire life in Paris and may never have left France. He was born in 1795 (a date revised in the 1990s from 1796 as a result of Martin Sonnabend's recalculation of the Revolutionary calendar). He is reported to have had minimal formal schooling even in reading, and to have acquired his extensive liberal-arts education on his own. His initial professional training was in metalwork: first with his father, a goldsmith from Lyons, then with a metal engraver in military equipment, and finally with Martin-Guillaume Biennais (active 1800-1832), then master goldsmith to Napoleon. After serving in the army from 1812 to 1814, Barye trained in the fine arts with sculptor François-Joseph Bosio (1768-1845) and painter Baron Gros (1771-1835). He then studied at the Ecole des Beaux-Arts from 1818 to 1823. His miniature medallion, Milo of Crotona Devoured by a Lion, won an honorable mention in metal engraving in 1819, but he failed to win the Prix de Rome. He worked as a craftsman for the goldsmith Jacques-Henri Fauconnier (1779-1839) from 1823 to 1831 and made his Salon debut in 1827 with a selection of busts. 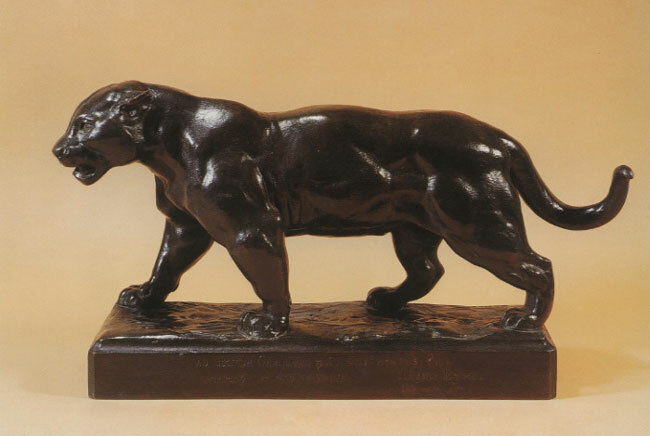 Antoine-Louis Barye made his critical and public mark as a sculptor four years later, in the Salon of 1831, with groups representing predatory violence in the wild. His first government commission came soon after, precisely for such a subject. The Minister of the Interior purchased Barye's monumental plaster Lion (since called Lion Crushing a Serpent), shown in 1833, and had it cast in bronze by Honoré Gonon and shown in 1836, before placing it in the public Tuileries Gardens (now Musée du Louvre, Paris). In 1834 Barye was chosen for a project that was never executed, the colossal eagle as the crowning element of the triumphal arch at the Etoile. Around 1836 the government commissioned him to execute the emblematic animal decoration on the July Column at the place de la Bastille, inaugurated in 1840. He produced a monumental effigy of Saint Clotilde for the Church of the Madeleine, Paris, in the early 1840s. In 1846 the government commissioned a pendant Seated Lion for the Tuileries Lion Crushing a Serpent (1847, bronze, Portal, Pavillon de Flore, Palais du Louvre, Paris). During these same years the royal family began buying and commissioning small-scale works from Barye for their private collections. Around 1834, the duc d'Orléans commissioned a highly publicized surtout de table representing hunts of different regions and historical periods, possibly one of several tabletop projects that he ordered from Barye. The duc's sister Marie d'Orléans allegedly commissioned a lost-wax bronze of Barye's Charles VI Surprised in the Forest of Le Mans (location unknown; later serial variants), a model first shown in the Salon of 1833; his brother, the duc de Montpensier, apparently commissioned a pair of figurative candelabra and a clock surmounted by Barye's Roger and Angelica (1840-1846, location unknown; later serial variants) as a mantelpiece garniture. Barye submitted works to the Salon only rarely after the jury rejected his surtout elements in 1837. Unable to capitalize on that outlet and on royal patronage, which declined after the death of the duc d'Orléans in 1842, he embarked on a new venture that lasted his entire career. He began to market his figurative and ornamental works as small-scale serial bronzes, first through the foundry Maison Besse in 1844, then directly to the public. He then worked in partnership with entrepreneur Emile Martin from 1845 to 1857, after which he proceeded independently. 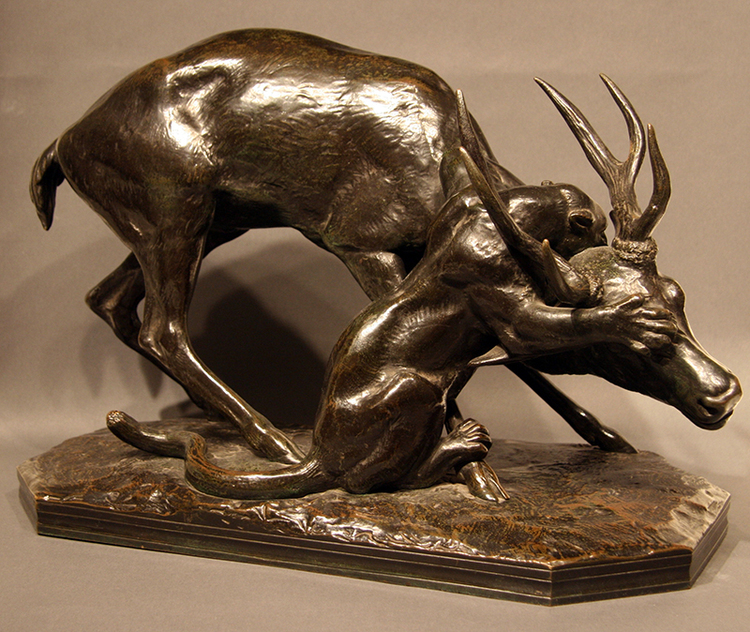 This serial production provided Barye's most widespread and enduring reputation, with casts distributed throughout the United States and Europe during the artist's lifetime. In the process he closely aligned himself with high-quality industrial craftsmanship. He won the coveted Grand Gold Medal for technical excellence for a selection of his serial proofs in the industrial arts section of the Paris Universal Exposition of 1855, while simultaneously garnering accolades in the fine arts section for his bronze Jaguar Devouring a Hare (Musée du Louvre, Paris). In 1863 he became a founder and president of the consultative Commission of the Central Union of the Arts Applied to Industry. Other professional skills were put to work during the Second Republic and the Second Empire. Beginning in 1848, Antoine-Louis Barye served as director of plaster casting at the Louvre and curator of the gallery of plaster casts. In 1850 he taught drawing at the agricultural school at Versailles and, from 1854 until his death, he was master of zoological drawing at the Muséum d'Histoire Naturelle, where the young Rodin briefly studied with him in 1863. Simultaneously, his career as a monumental sculptor revived. He received several government commissions during this period: ornamental eagle reliefs for the Pont d'Iéna (1849); a series of decorative masks for the Pont Neuf (c. 1851); four allegorical seated groups (Strength, Order, Peace, and War) for the facade of the Louvre (1854); an allegorical pedimental relief, Napoleon I Crowned by History and the Fine Arts (1857); and a bronze relief with the equestrian portrait of Napoleon III as emperor, à l'antique (1861, destroyed; presentation drawing, Musée du Louvre, Paris, office of the architect-in-chief). Barye received two important government commissions for provincial dynastic equestrian monuments: the imperial Napoleon I surmounting the Bonaparte family monument at Ajaccio, inaugurated in 1865; and a second Napoleon I for Grenoble, a commission of 1862, which he abandoned in 1866. In 1869 Barye executed pairs of monumental lions and tigers in stone for the gates of the Palais de Longchamps at Marseilles. During the Second Empire Barye was showered with distinctions. He received the Légion d'Honneur in 1833 and was promoted to chevalier in 1855. In 1868 he was elected to the Institut de France. He died in Paris in 1875, and after an elaborate funeral to signal his high artistic stature, Barye was buried at Père-Lachaise Cemetery. Though also a painter and printmaker, Antoine-Louis Barye triggered important debate, through his sculpture, about animal subjects, complex narrative, stylistic realism, and the threshold between fine and decorative art. He was a master of anatomical form, whether human or animal. His work became a benchmark for animal sculpture in monumental and table-top format. The latter often conveyed a powerful sense of grand scale, just as his monumental work successfully blended rich materialism, naturalistic detail, and broad rhythms. Barye's advocacy of good design and craftsmanship in serial work that was affordable to the middle class broadened options available to artists, artisans, and patrons alike. His example and success enhanced the modest reputation of animal and small-scale sculpture as "fine art" during the nineteenth century” (National Gallery of Art Systematic Catalogue, “Barye, Antoine-Louis"). Please contact us if you are interested in selling your Antoine-Louis Barye sculptures or drawings or other artwork from the 19th century and early 20th century.